The Endpoint Detection and Response Market size is expected to grow from USD 749.0 million in 2016 to USD 2,285.4 million by 2021, at a Compound Annual Growth Rate (CAGR) of 25.0%. EDR solutions are required for various enforcement points, such as workstations, mobile devices, servers, point of sale terminals, and others. 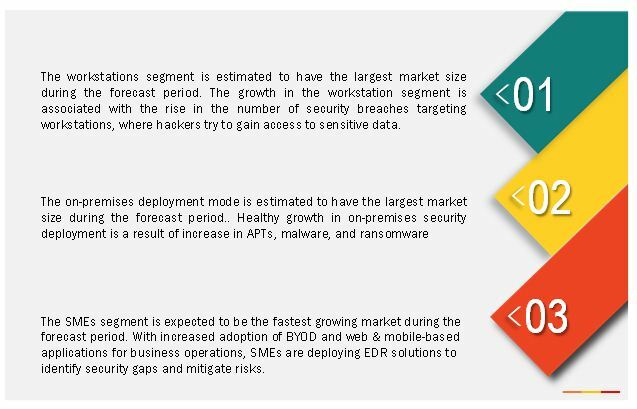 Increasing adoption of enterprise mobility and BYOD trends along with an overall rise in the number of enterprise-targeted cyber-attacks have led to growth of the EDR market. The growth of the Market is also propelled by the increasing integration of mobile and web applications and platforms across enterprises. The base year for the study is 2015 and the forecast period is considered to be 2016 to 2021. The need to mitigate IT security risks is still the primary goal of enterprises. As businesses grow, new and sophisticated threats, for example zero-day malware, Trojans, and APTs, are created every day, putting c’ critical data at risk. This has encouraged enterprises to deploy EDR solutions to safeguard their endpoints and networks against potential cyber-attacks. The APAC and MEA are expected to witness a surge in deployment of such solutions, as these regions are going through industrialization, which has led to an increase in endpoint attacks. In order to mitigate IT security risks, enterprises can focus on training security staff in security policies and practices, managing access controls, encrypting data, and deploying security monitoring solutions. Focusing on training would help enterprises to significantly reduce the managed services cost; it would also help them develop their own cyber security team, eliminating the need to depend on a third party for their security needs. The Endpoint Detection and Response Market comprises key vendors, such as McAfee, LLC (US), Cisco Systems, Inc. (US), RSA Security LLC. (US), FireEye, Inc. (US), Guidance Software, Inc. (US), Carbon Black, Inc. (US), Digital Guardian (US), Tripwire, Inc. (US), Symantec Corporation (US), and CrowdStrike, Inc. (US). These vendors sell EDR solutions to end-users to cater to their unique business requirements and security needs. In August 2016, Symantec acquired Blue Coat Systems, an advanced web security solutions provider for approximately USD 4.65 billion. Symantec will enhance its capabilities in advanced network and cloud security solutions. In July 2016, Carbon Black acquired Confer, a leading antivirus company. This will enable Carbon Black to deliver enhanced endpoint detection solutions. Confer’s security solution has been renamed Cb Defense. In October 2016, Symantec Corporation entered into a strategic partnership with VMware, a global cloud and mobility leader, to collaborate on endpoint management and threat security. Symantec will also join hands with VMware Mobile Security Alliance to deliver integrated identity management and endpoint management solutions. What are new enforcement points which the EDR companies are exploring? The Endpoint Detection and Response Market size is expected to grow from USD 749.0 million in 2016 to USD 2,285.4 million by 2021, at a Compound Annual Growth Rate (CAGR) of 25.0% during the forecast period. 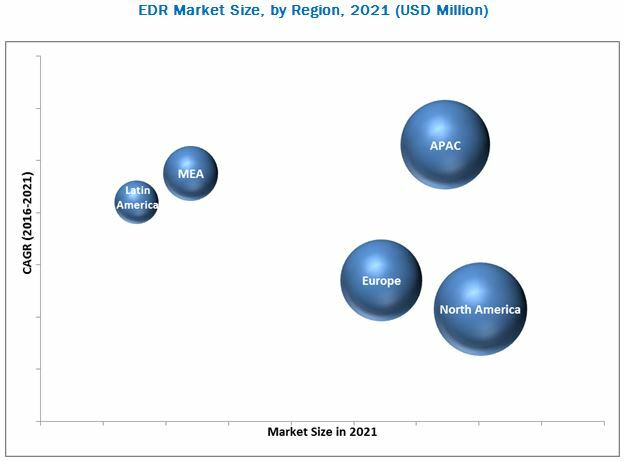 The major growth drivers of the EDR market include the need to mitigate IT security risks and increasing instances of enterprise endpoint-targeted attacks, coupled with the surge in demand from Small and Medium-sized Enterprises (SMEs), owing to the rise in the adoption of hosted EDR solutions. EDR is a next-generation enterprise endpoint security solution that makes use of a set of tools and solutions to detect, identify, monitor, and handle malware and other Advanced Persistent Threats (APTs), and provides an effective response and remediation. Modern EDR solutions integrate virtual learning and behavioral analytics and function beyond the detection of incidents and response to make threat predictions ahead of time. Advanced EDR systems help reduce the overall attack surface, minimize the impact of an attack, and use virtual intelligence and observation to predict cyber-attacks before their occurrence in the enterprise ecosystem. Vendors are offering hosted EDR solutions that effectively help organizations detect modern-day cyber threats in real time and respond accordingly. Major solution suppliers also offer supporting services such as integration and training, along with support and maintenance for seamless transition and implementation of EDR solutions. The Endpoint Detection and Response Market by component has been segmented, on the basis of solution and services. The market for services segment is expected to grow at the highest CAGR between 2016 and 2021. The high adoption of EDR solutions and services by the global organizations contribute to the rapid growth of the market. EDR solution can be used for enforcement points such as workstations, mobile devices, servers, point of sale terminals, and others. The workstations segment is estimated to have the largest market size during the forecast period. The growth in the workstation segment is associated with the rise in the number of security breaches targeting workstations, where hackers try to gain access to sensitive data. With vulnerabilities becoming more complex and sophisticated, the demand for endpoint security products to counter the growing challenges posed by the threats is expected to increase. The mobile devices segment is estimated to grow at the highest CAGR during the forecast period, due to rise in malware, APTs, and phishing attacks. Hybrid deployment is the fastest-growing deployment mode in the Endpoint Detection and Response Market, as it benefits organizations with increased scalability, speed, 24/7 services, and enhanced management capabilities. Small & Medium-sized Enterprises (SMEs), in particular, have opted for hybrid deployment, as it can help them avoid costs pertaining to hardware, software, storage, and technical staff. BFSI and other financial institutions are upgrading physical and endpoint security solutions to protect the industry’s employees, customers, assets, offices, branches and operations, and to optimize against internal and external threats. The critical data, database, applications and servers are under constant risk of being breached by attackers. The increase in smart banking, Internet banking, and mobile banking requires endpoint security to be embedded in every micro and macro component of information systems in the BFSI sector. The growing number of breaches in the government and public utilities sector has increased the need for endpoint security to combat advanced threats. EDR solutions provide complete visibility at endpoints and make use of machine learning algorithms and big data behavioral analytics to provide signature-less detection. EDR solutions and services prevent APTs, ransomware, malware, viruses and phishing mails, and also monitor back entries. Governments around the world have initiated stringent cyber and IT laws and legal and regulatory compliances for protecting enterprises and consumers from advanced cyber-attacks. Retail organizations are now adopting new technologies, such as location-based marketing and internal work localization from one floor to another, to attract customers & and take full advantage of online business opportunities, which are vulnerable to threats. Retail organizations must secure network points that such as PoS terminals, e-commerce websites, third-party vendors, employee’s access points, and increasing IoT-based devices, such as printers & and security cameras. Various initiatives in the US, such as Retail Industry Leaders Association (RILA) and Retail Cyber Intelligence Sharing Centre (R-CISC), in America are also contributing significantly towards cyber security awareness. Healthcare data records are a very attractive target for attackers, as they contain valuable sensitive information. Stealing financial data has always been the primary target of cyber-attackers, but these days medical data is also becoming one of the major targets. Healthcare organizations face several challenges, such as maintaining the privacy of Electronic Health Record (EHR) and meeting various compliances set by the HIPAA. Due to highly proliferated digital medical devices, network and endpoint management and protection has become an essential need to save devices from malicious attacks. What are the applications areas of EDR? Budget constraints to implement new EDR technology infrastructure is a major challenge in the growth of the market. The cost of innovation is high for strong and advanced security, especially for SMEs which view budgetary constraints as a barrier to the growth of the EDR market. Undertaking IT security operations effectively without affecting adequate budgetary constraints is a huge challenge for SMEs. Since SMEs are facing budgetary issues, organizations need to understand which information assets are more important to control the increase in security threats. The key players in Endpoint Detection and Response Market include McAfee, LLC (US), Cisco Systems, Inc. (US), RSA Security LLC. (US), FireEye, Inc. (US), Guidance Software, Inc. (US), Carbon Black, Inc. (US), Digital Guardian (US), Tripwire, Inc. (US), Symantec Corporation (US), and CrowdStrike, Inc. (US).